Our race debut at CPKC, three years ago! The thing about kart decals is they need to look good. I spent hours in Photoshop putting various designs together in a bid to find something that struck a chord. Initially I was thinking ‘red Tony Kart Variant’ but it quickly became clear that Junior wanted to keep with the British racing green theme that we inherited when we bought our first kart. It turned out that Caterham had planned to start their own budget kart series based around an in-house chassis design and an X30 engine. It went by the wayside when the Caterham motorsport arm collapsed although the karts they had made were sold when a large chunk of the F1 team’s assets were subsequently auctioned. I hadn’t really wanted to simply copy someone else’s design but this was the design that Junior wanted from the moment he saw it. Their kart even featured the FP7 nosecone that I was intending to move to (simply because I thought it looked much cooler than the M4 at the time). There was a fair amount of toing and froing but the results were really pleasing. When we had the first decals made, I was a bit wary of fitting them myself so had Kart David do that part also (for a small fee). It would have been fine though; the soapy water and hairdryer method has subsequently worked very well for me. 1. Really know what sort of thing you want. Search the internet for inspiration. Save images of existing decals that you like so that you can give any designer an idea about what you are after. The more you give them, the closer their initial design will be to your ideas. 2. Find a decals printer that has templates for your bodywork and work with them. Don’t be afraid to ask for changes (I’ve always hit double digits for version increments!). 3. Kiss goodbye to those shiny, new decals the second the adhesive dries! 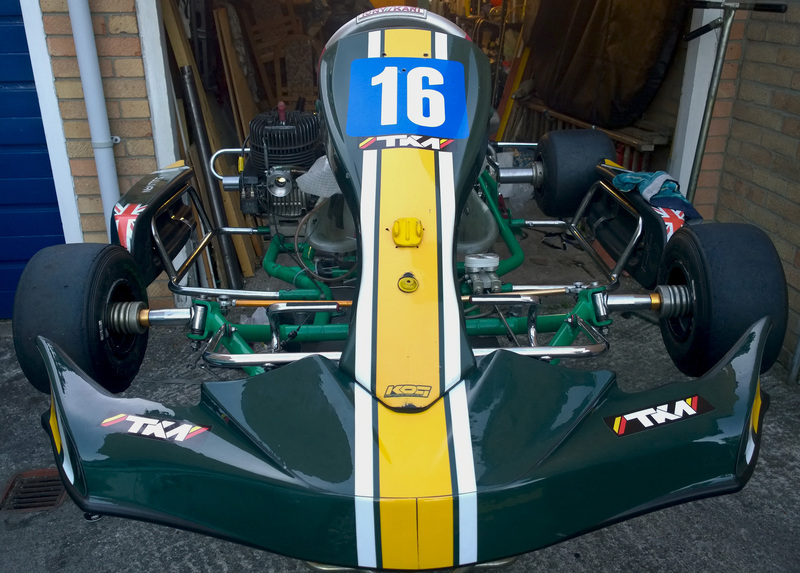 This entry was posted in Beginners Guides and tagged custom, decals by Karting Dad. Bookmark the permalink.